Top quality short handle gardening hand tools. 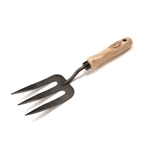 Our Forged Tulip Trowel was a best seller at the 2011 Chelsea Flower Show. This trowel is excellent for clay soil.It digs and breaks up soil like a fork, but works like a trowel. 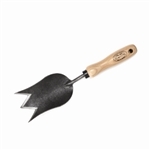 This is a quality crafted Dutch garden tulip trowel that is handcrafted in Holland. The Trake is the ultimate garden tool. It's a trowel and it's a rake. It's 2 tools in one. The Trake has a long 17" handle with a nice angle for leverage. Great for digging and cultivating. Great to cultivate between narrow rows. It has a rugged die cast alloy blade with a shaft that won't rust or bend. The shaft has a nice non slip coating for a grip. The trowel has markers for precision bulb and seed planting with a tip that easily penetrates the soil. The rake has solid die cast tines that can't bend. This is a handy garden tool. 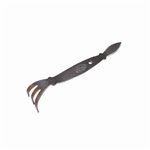 Sleek and strong, our small hand cultivator is a great hand held, Dutch made garden tool. Compact and light weight, allows for precision work in the garden. Three tine cultivator on one end with cobra head on the other. Very handy and useful garden tool. Made of steel. Our Forged Dutch Hand Fork is one tough tool! It's great for breaking up soil in small areas, aerates clay soil and is well balanced. A strong and tough tool with a lifetime guarantee. Made in Holland. 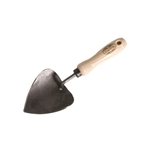 Our dutch potting trowel is ideal for potting and transplanting. The curved blade prevents soil from spilling out. The blade is shorter and wider than a standard trowel for potting work. The unique angle and shape makes weeding and cultivating easy in any soil. Just drop the head with its extra sharp blade into the soil and draw toward you. Waxed FSC Beechwood handle, brass ferrule and stainless steel head. Measures 9" by 2.5" W.